This entry was posted on January 16, 2017 by Mari. Crystal Red (and Black) shrimp popularity is ever-increasing: this bee shrimp variety is relatively easy to keep, a large tank is not necessary and breeding them can be a fun and even profitable project. If you're getting started with your own Crystal Red shrimp colony, the various different grades and color patterns might prove rather confusing. Why are some very expensive and others much cheaper? What defines a 'high quality' Crystal Red? 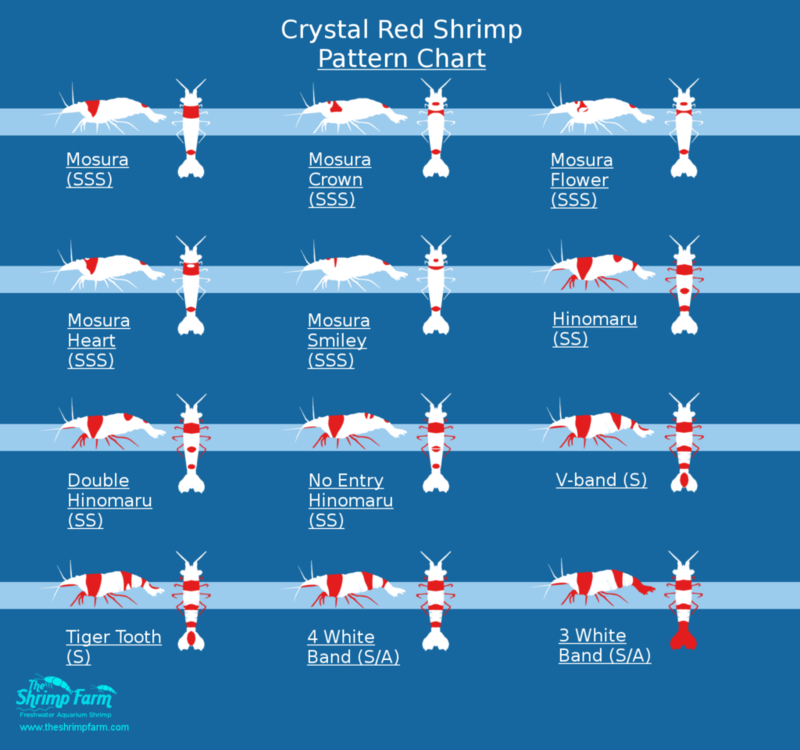 Keep reading for everything you need to know about Crystal Red shrimp grading! When figuring out what grade a Crystal Red shrimp is, there are a few basic rules to keep in mind. The more white, the better - except for full white. An entirely white shrimp is still graded very high, but can't achieve the highest possible grade. Opacity matters - shrimp with translucent splotches are graded significantly lower. The more opaque the colors, the higher the grade will be. Older shrimp can lose a bit of color/opacity - however, this doesn't mean they don't still carry the genes. 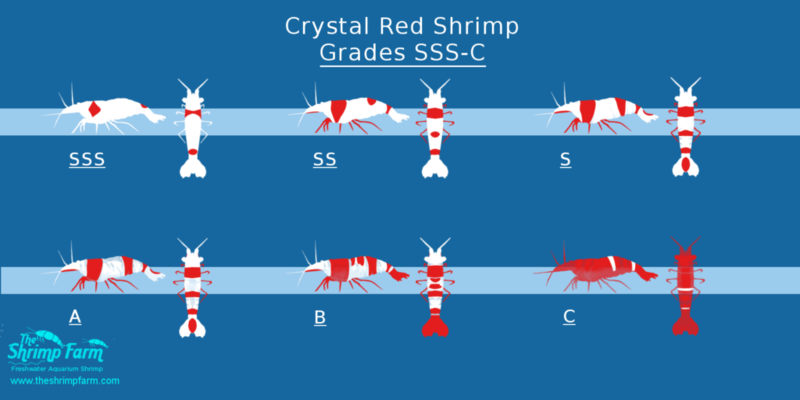 Crystal Red shrimp grades range from SSS (highest) to C (lowest). Descriptions for all grades can be found below. 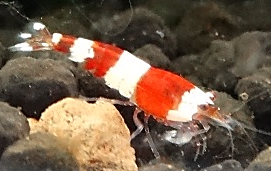 C-grade Crystal Red shrimp are still relatively close to the original Crystal Red coloration-wise, with an almost fully red body and only very thin white stripes. Their color is not very opaque and they are not very popular in the hobby right now. B-grade Crystal Reds have more white color than C-grades, though the coloration is still relatively blotchy. Actual bands of color are starting to appear but are still far from perfect. A-grade Crystal Reds are a good choice for beginners: they have relatively nice opaque coloration with defined bands compared to B-grades but are still quite cheap compared to the higher grades. S-grade Crystal Reds have relatively opaque coloration with more white and a less clearly defined middle red band than A-grades. Good color solidity with extra white and certain color patterns can upgrade a shrimp from S to S+ (more information on patterns below). SS-grade Crystal Red shrimp have slightly less red color than S-grade specimens, which makes their quality higher. They have less color on the middle of their sides: instead of the band S-grades have, the coloration is shaped more like a dot. This dot is referred to as a Hinomaru (more information on patterns below). As per the regular Crystal Red grading rules, SSS has the most white and is thus the highest grade. The exact pattern and coloration determines how high a shrimp scores within the SSS grade and its price. Crystal Red shrimp are not only graded by color distribution and opacity: certain patterns can also improve or lessen quality. The most common Crystal Red patterns are discussed below. Mosura flower - Coloration along the side of the head features a patch of white in the middle, creating a somewhat flower-like pattern. Mosura crown - A white half-circle in the red coloration on the top of the head gives the appearance of a crown. Mosura heart - A dash of white in the red coloration on the top of the head makes for a pattern somewhat reminiscent of a heart when viewed from the side. Mosura smiley - The red on the head is limited to a dot on the top with a dash right behind it, giving the appearance of a smiley face when viewed from the top. A Hinomaru is a red circle located on the top of an SS grade Crystal Red shrimp's back. No-entry Hinomaru - A dash of white passes through the middle of the Hinomaru, giving it the appearance of a no-entry sign. Double Hinomaru - In addition to the first Hinomaru on the top of the back, there is an additional dot (instead of a band) on the tail. In the S-grade, two patterns are commonly recognized that can 'upgrade' a shrimp from simple 'S' to 'S+'. The amount of white bands can also vary. Tiger tooth - The middle red section is not a full band; instead, there is a triangular spot of white located at the bottom. This white triangle looks somewhat like a tooth. V-band - Again, the middle red section is not a full band but instead shaped like a triangle. Quite similar to the tiger tooth pattern but even less red color is present as it lacks the extra red dash. 4 white bands - As the name suggests, the coloration is divided into four white bands and three red bands. This pattern is also found in A-grade shrimp. 3 white bands - Similar, but not the same: these shrimp lack the last white band on the tail. Instead, the entire tail is red and/or translucent. This pattern is also found in A-grade shrimp. As you can see, there's a lot more to Crystal Red (and Crystal Black) shrimp than one might assume at first glance. If you're interested in keeping this fascinating species The Shrimp Farm can help you start your very own colony: we sell both Crystal Red shrimp and Crystal Black shrimp.